Chemical interactions at crystal-water interfaces are crucial to a broad range of scientific and technological topics, including corrosion, heterogeneous catalysts, chemical sensors, teeth and bones, and a host of everyday products from paints and glues to solvents and cleaners. 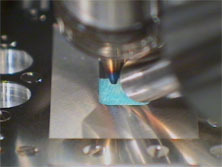 Geochemists pay special attention to reactions that occur between mineral surfaces and aqueous species – interactions central to weathering and soil formation, hydrothermal ore deposition, pH buffering, biomineralization and biofilm formation, uptake and release of chemicals that affect water quality, and many other natural processes. Adsorption of organic molecules on mineral surfaces has long been studied in connection with scenarios for life’s origin. Prebiotic synthesis of relevant biomolecules (the first step in biogenesis) has been demonstrated for numerous plausible environments, including Earth’s Hadean surface, dense interstellar clouds and hydrothermal systems. A central challenge in origins research is elucidation of the next step – efficient mechanisms for selection, concentration and organization of monomers into life’s macromolecules. Many minerals have thus been studied as possible templates for organic adsorption. Hazen's studies of mineral surfaces focus on several complementary aspects, including (1) identification and characterization of common faces of rock-forming minerals; (2) experimental study of molecular adsorption for individual mineral-molecule pairs by several methods; (3) theoretical studies of atomic-scale interactions between small organic molecules and mineral surfaces; and (4) studies of surface structure and molecular interactions using neutron scattering at Oak Ridge national laboratory, X-ray sctattering at Argonne National Laboratory, and laser spectroscopic techinques at Northwestern University and the Carnegie Insitution. One focus of Hazen's mineral surfaces research is the characterization of surface structures, especially chiral surfaces, of common rock-forming minerals. Hazen and colleagues found that most rock-forming minerals display at least one common chiral surface. They have also developed a “chiral index” to estimate the enantioselective potential of different surfaces. Crystals commonly display three types of chiral surface features, illustrated in these idealized drawings. Recent and ongoing experiments are designed to measured the relative adsorption of different sugars and amino acids on different mineral surfaces. For example, Hazen and colleagues demonstrated the chiral selection of D- and L-ASP on calcite (214) by immersing a carefully cleaned calcite crystal in a racemic ASP solution for 24 hours, washing the crystal, removing any adsorbed ASP with dilute HCl, and analyzing the desorbed amino acid with sensitive chiral GC techniques. 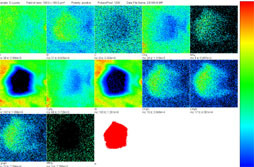 The group devotes considerable effort to the characteriazation of mineral-molecule interactions using batch adsorption and potentiometric titration, supplemented by infrared spectroscopy. Hazen and colleagues' study of the adsorption of glutamate onto rutile exemplifies this work. They studied the adsorption of L-glutamate on the surface of rutile (a-TiO2, pHPZC = 5.4) in NaCl solutions using potentiometric titrations and batch adsorption experiments over a wide range of pH, ligand-to-solid ratio and ionic strength. Between pH 3 and 5, glutamate adsorbs strongly, up to 1.4 mmol m-2, and the adsorption decreases with increasing ionic strength. Potentiometric titration measurements of proton consumption for the combined glutamate-rutile-aqueous solution system show a strong dependence on glutamate concentration. An extended triple-layer surface complexation model of all the experimental results required at least two reaction stoichiometries for glutamate adsorption, indicating the possible existence of at least two surface glutamate complexes. A possible mode of glutamate attachment involves a bridging-bidentate species binding through both carboxyl groups, which can be thought of as “lying down” on the surface (as found previously for amorphous titanium dioxide and hydrous ferric oxide). Another involves a chelating species which binds only through the g-carboxyl group, i.e. “standing up” at the surface. The calculated proportions of these two surface glutamate species vary strongly, particularly with pH and glutamate concentration. Overall, their results serve as a basis for a better quantitative understanding of how and under what conditions acidic amino acids bind to oxide mineral surfaces. Hazen and colleagues have used density functional theory to study possible bonding configurations and relative energies for left- and right-handed amino acids adsorbed onto the calcite (214) surface, one of the commonest chiral surfaces in nature. The models start with unrelaxed surfaces and the amino acid in a plausible starting configuration. All atom positions are unconstrained in the models. After convergence there is significant surface relaxation of the calcite and shifts in the molecular position of the amino acid, but relatively little change in the molecular conformation. In the case of alanine adsorbed onto the calcite (214) surface, they found two strong points of interaction – one Ca-O bond and one O-H bond forms. However, there is no significant difference in adsorption energy between the case of L-ALA versus D-ALA. Note that two points of bonding are insufficient to produce chiral selection. In the case of aspartic acid adsorbed onto calcite (214)-type surfaces, they found a significant difference in the energy of the minimized solution depending on the molecular handedness. 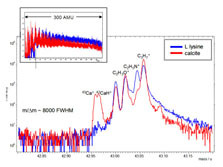 L-ASP forms two strong bonds on the (214) surface, but D-ASP forms three strong bonds (two Ca-O and one O-H) and consequently has ~8 kcal/mol lower energy. This fortuitous geometrical match explains the experimentally observed chiral selective adsorption of ASP on calcite. The number of possible mineral-molecule pairs that Hazen and colleagues would like to study is much too great for separate experiments on each combination. They have thus been studying applications of microarray technology to document semi-quanitatively the extent of adsorption of sugars and amino acids on various mineral surfaces.